Delhi police on Wednesday detained over 60 students from Manipur for burning effigies of Prime Minister, Narendra Modi near the Parliament. 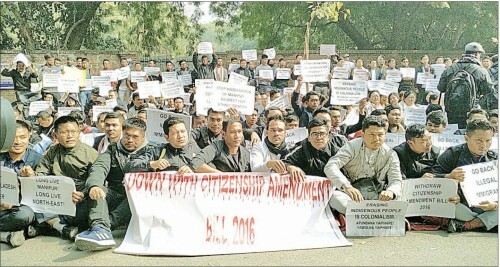 Nearly 200 students from Manipur staged a sit-in demonstration at Jantar Mantar in New Delhi demanding withdrawal of the Citizenship (Amendment) Bill. The protest was organized under the aegis of six students groups from Manipur – All Manipur Student’s Union (AMSU), Manipur Students’ Federation (MSF), Democratic Students’ Alliance of Manipur (DESAM), Kangleipak Students’ Association (KSA), Students’ Union of Kangleipak (SUK) and Apunba Irreipakki Maheirosing Singpanglup (AIMS) in collaboration with Manipur Students’ Association Delhi (MSAD), Delhi Association of Manipuri Muslim Students (DAMMS), United Kakching Student (UNIKAS) and North-East Forum for International Solidarity (NEFIS). These student groups have been organizing series of protests in Manipur opposing the citizenship bill. The protest demonstration at the Jantar Mantar started from 11 am and lasted till 3 pm. Later, the student protestors reportedly burnt the effigy of Prime Minister Narendra Modi near the Parliament which resulted in the arrest of the students. On the other hand, Manipur chief minister, N Biren Singh on Wednesday left for New Delhi to attend a meeting of the chief ministers of north-eastern states with union home minister, Rajnath Singh. Interacting with media fefore leaving Imphal, Biren told media persons that he would request the home minister to review the prevailing situation of Manipur and the Northeast. He assured that he would try his level best to convince the union home minister to clear people’s doubt and apprehension prior to carrying out any future course of action. The Chief Minister also informed that the state government has been observing the situation and continuously conveying to the Centre on the apprehension surrounding people’s mind with regards to the Bill.